Join us from 5:30 -7:30 pm for a presentation by Susannah Sayler and Edward Morris of the Canary Project. This artist talk is part of EXTRACTION, a research program exploring the industrial operations which abuse natural resources and thrive off of labor exploitation and racialized impoverishment. EXTRACTION is coordinated by A. Laurie Palmer of the Art Department and TJ Demos of the Center for Creative Ecologies and features an artist lecture program, film screenings, field trips, and a conference, interrogating the current cultures of extraction. This event is FREE and open to the public. Metered parking is available in the Performing Arts lot. 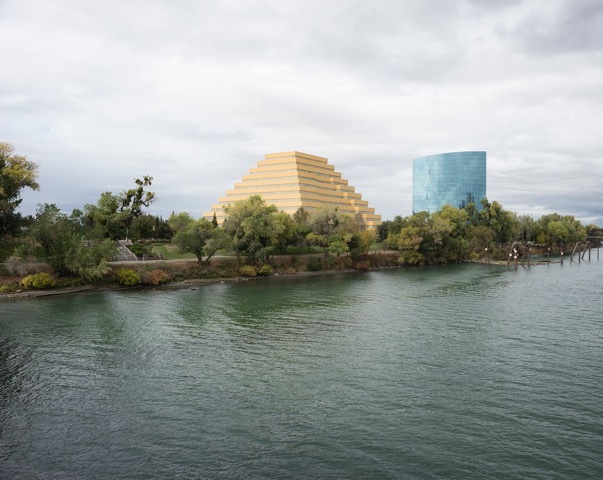 Sayler/Morris of The Canary Project will discuss their current work, Water Gold Soil: The American River. The project, which consists of photographic and video works, archival images, maps and writing, tells the story of a single flow of water in present-day California from origin point to end-use. The project is both a form of historiography and a form of allegory – using this swath of geography to investigate our present Age of Extraction. As with other water flows in the American West, the “American River” is no longer a river at all, but an elongated site of water capture and distribution, with a definite beginning but diffuse end. Susannah Sayler and Edward Morris (Sayler/Morris) work with photography, video, writing and installation. Of primary concern are contemporary efforts to develop ecological consciousness and the possibilities for art within a social activist practice. In 2006 they co-founded The Canary Project - a collaborative that produces art and media that deepen public understanding of ecological issues such as climate change, extinction, food systems and water resources. Sayler/Morris were recently awarded 2016 NYFA Artist Fellowships and the 2016 David Brower Center ART/ACT Award & Exhibition. They have also been Smithsonian Artist Research Fellows, Artist Fellows at The Nevada Museum of Art’s Center for Art + Environment and Loeb Fellows at Harvard University’s Graduate School of Design. They currently teach in the Transmedia Department at Syracuse University where they co-direct The Canary Lab. *All lectures and screenings are on Tuesday evenings, 5:30-7:30pm, in DARC 108 at UC Santa Cruz unless otherwise noted.